We start our look back at April over the years with a fine shot from Bob Thorpe of a British United Airways (BUA) Bristol Britannia landing over Runway works (06) on 10th April 1968. As they say every picture tells a story and we can certainly see from this shot that times have changed in the 51 years since it was taken.Indeed,Aerodrome operations,safety and control of works are somewhat different today…I wonder if they did a risk assessment? I think we all love a classic shot of a Dakota! Here’s a beauty from 8th April 1971 submitted from the Eric Wright collection. 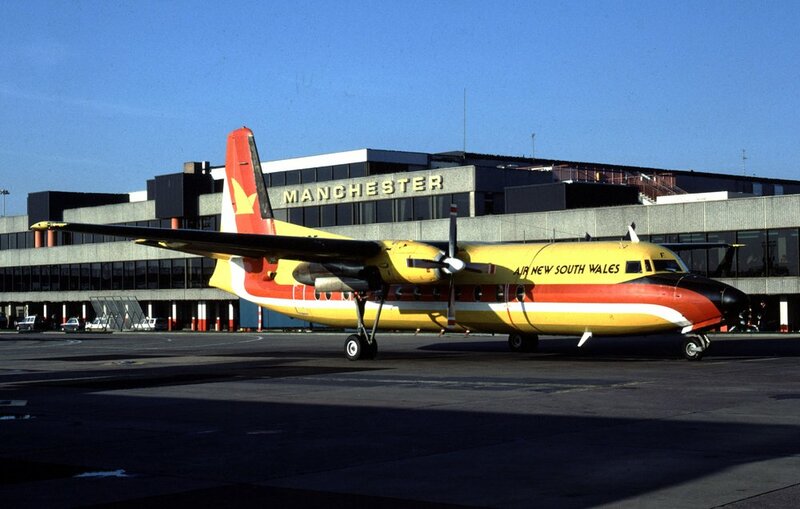 Dutch carrier Moormanair were occasional visitors to Manchester . DC3 PH-MOA strikes a typical pose on the East side of Pier B. 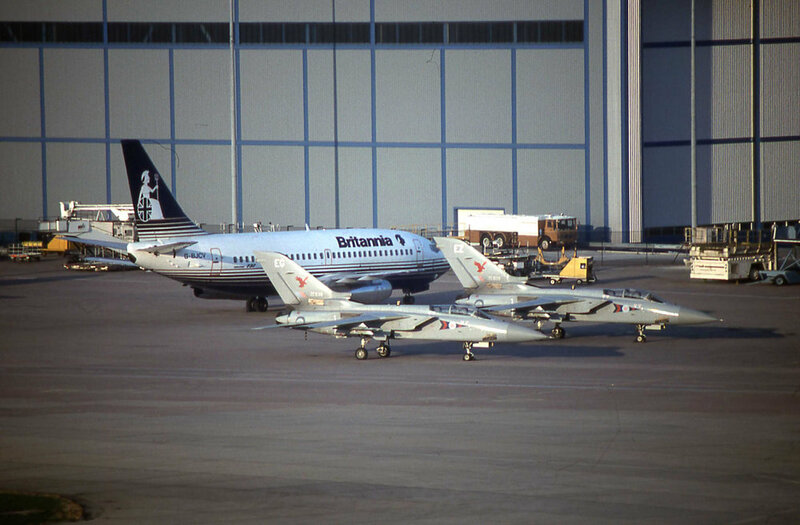 Quite a rare shot of a Bavaria BAC 1-11400 at Manchester with thanks to Eric Wright. D-ALLI is seen here parked on a somewhat “contaminated” stand on Pier B -11th April 1971. Probably one of the highlights of 1973 and certainly a movement which was talked about for some time by the enthusiast community! …25th April 1973 saw Alitalia B747-200 I-DEMU arrive to take Juventus fans home following their European Cup game against Derby County.The aircraft had arrived with the inbound fans into London Heathrow prior to positioning up for the departure from Manchester!!. Interestingly, I-DEMU went on to have something of a colourful life with several carriers including becoming G-VGIN (Scarlet Lady) with Virgin Atlantic in 1986. Her final years were spent with Nigerian carrier KABO Air as 5N-EEE operating out of Lagos.She was finally retired after 36 years in commercial operation to the Mojave desert (California) in 2007. 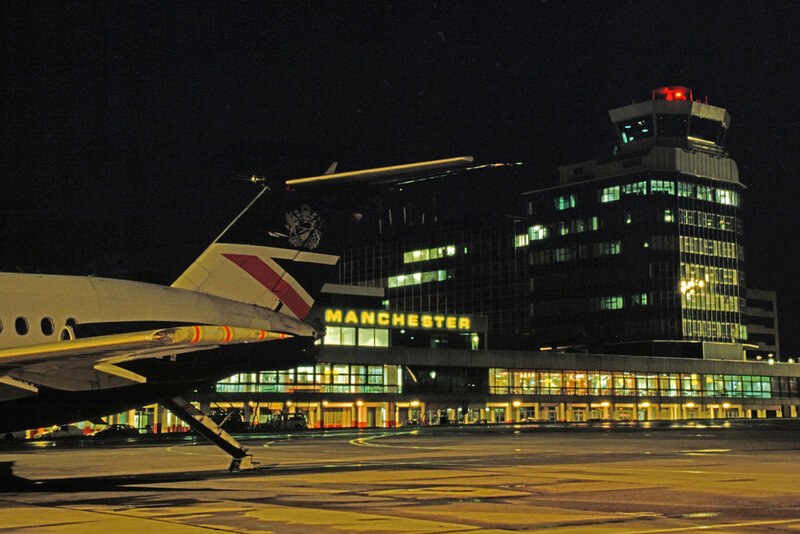 I’ve given up counting how many hotels there are nowadays (2019) around Manchester Airport.Well, in April 1966 it was pretty easy as there was only one. I’m not counting the Airport Pub although in those days it did actually offer a couple of rooms out on the top floor and I remember the landlady serving tea and toast to keen spotters as they watched the night freight flights from the corner room. Over the years (like they do) the hotel pictured has changed names and ownership several times.I think today its called the Crowne Plaza (Thank you Google!) in my day I remember it as the Excelsior. But we have here a wonderful photo it time by Bob Thorpe showing how different the skyline has changed since the photo was taken 53 years ago. It’s worth pointing out the former “RAF Barrack block” in the bottom right hand corner and what was the Airport Directors house in the left…perk of the job in those days! LOT IL62M SP-LBC takes on fuel from the Esso Bowser at the end of Pier B.April 1981 - Photo Peter H.
Another “classic” from the Eric Wright collection. Alitalia Caravelle I-DABE prepares to Taxi from Pier B on 10th April 1970. 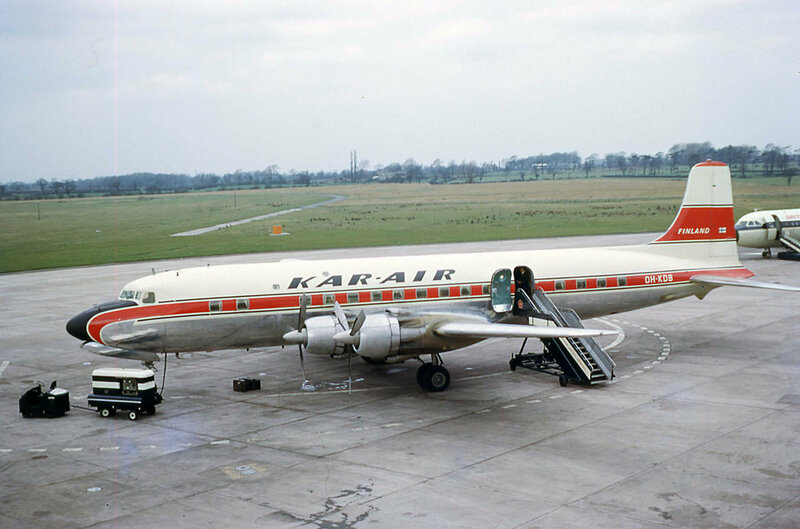 A beautiful photo taken by Bob Thorpe of a KAR-AIR DC6B OH-KDB (note the window curtains) on 4th April 1966. It looks like one of those new British United BAC1-11’s is just creeping in on the photo as well. Now where’s that new Pier going? 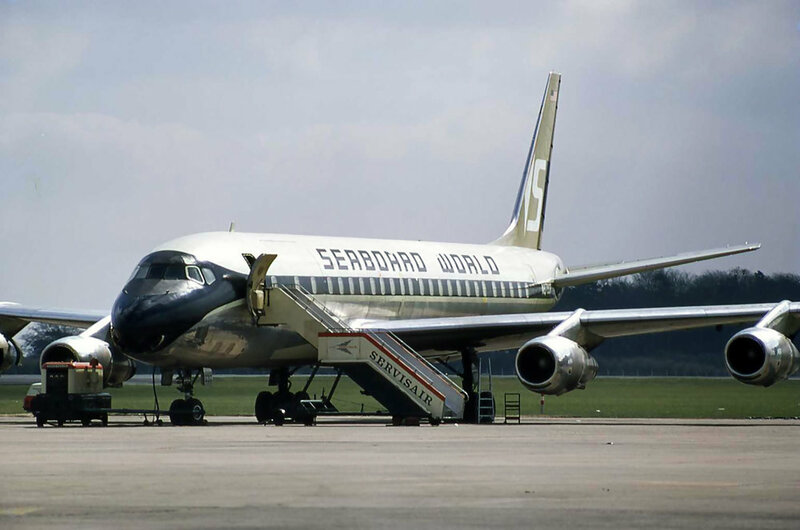 A Seaboard World Dc8 54CF N8783R arrived from Frankfurt on the evening of 10th April 1973. She is pictured here in the Southbay on 10th prior to departing to Nairobi via Athens with a load of fertiliser. Photo Bob Thorpe. 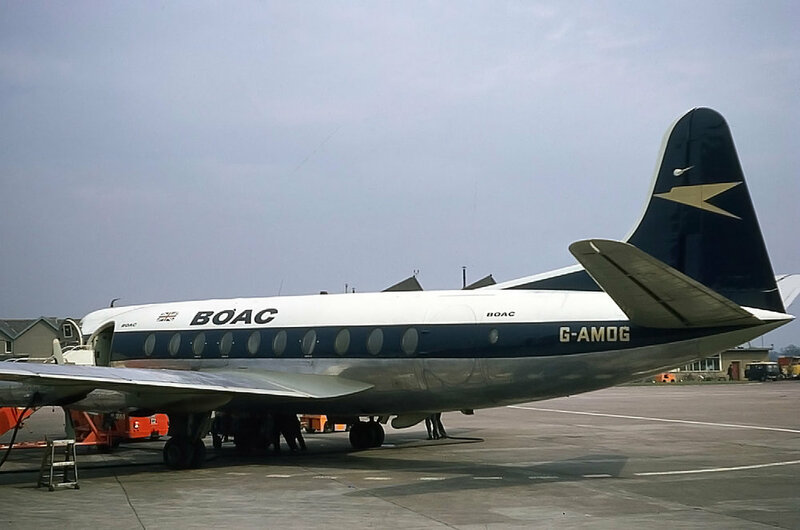 Former BEA and Cambrian Viscount G-AMOG is seen here at Manchester in BOAC livery on 21st April 1972. 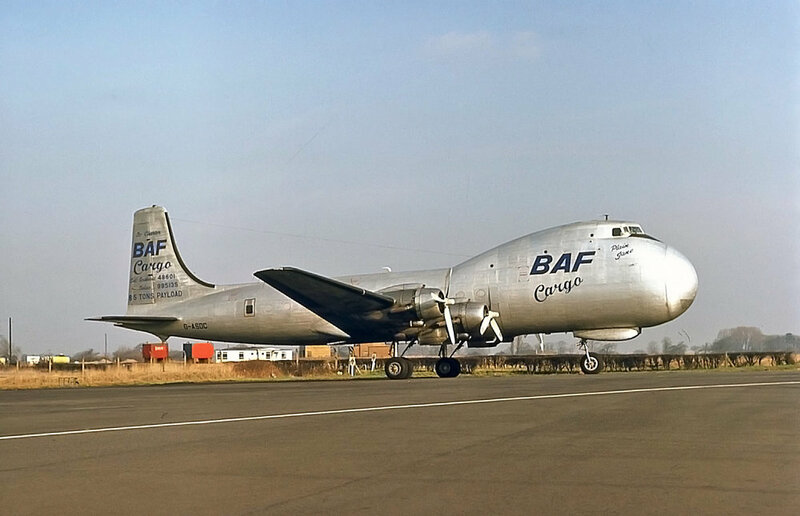 Viscount C/N 007 first flew in February 1953 and following years of service with our flag carrier she was initially preserved at RAF Cosford prior to being donated by British Airways to the Museum of Flight at East Fortune,Scotland which is where she still resides today. Photo Bob Thorpe. Air Botswana Avro 748 A2-ABB is seen here outside of Dan Air’s Hangar 4 in April 1976. My apologies for doing a bit of photo bombing on the photo…goodness me… Get your hair cut young man!! Dan Air (formerly British Eagle) BAC1-11- 300 G-ATPL cuts a fine site on the West side of Pier B in April 1971. Oh just look at that flat prime development land out towards the North West…I bet that will come in useful in the future? Photo Bob Thorpe. 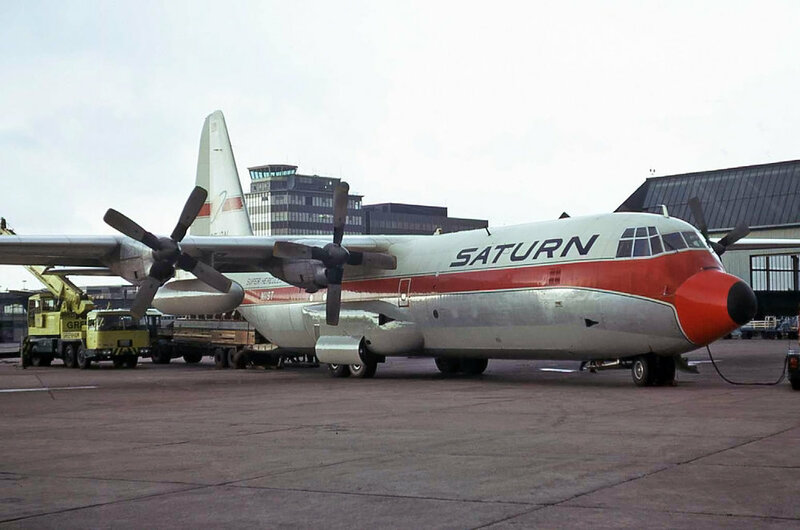 SATA Caravelle HB-ICO is standing proudly in the South bay on 12th April 1972.Photo Bob Thorpe. Yak 42 CCCP-42544 is captured by Stuart Prince approaching MAN on 11th April 1992. This was not only the aircraft’s first visit to MAN but also the first visit of a YAK 42 to the UK! Comets and Caravelles at Manchester..what more could you ask for? This photo from Bob Thorpe captures a superb period representing airliners with power and style - April 1971…. I remember it well. 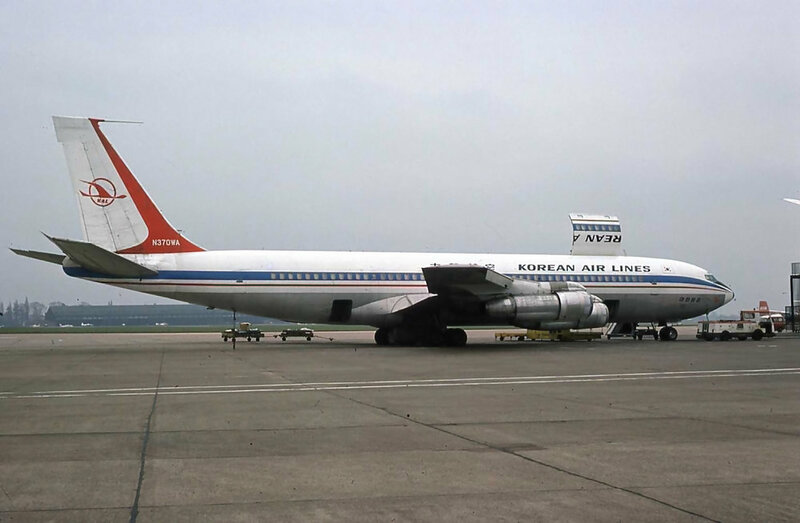 14th April 1970 and the days Cargolux operated CL44’s! TF-LLI a swing tail freighter is seen here on the old freight apron (now Terminal 3) at MAN having arrived from St Johns via Stockholm.Unfortunately, she had a pretty chequered history having travelled the world and in the process been involved in several accidents over its years.Having plied her trade for several operators in Europe,US,Africa and South America she was to end her days whilst operating for LASA in Columbia in 1986. Photo Bob Thorpe. An interesting photo taken just 17 years ago (5th April 2002) looking towards the T2 aprons from the top of the T1 Multi Story Car park. 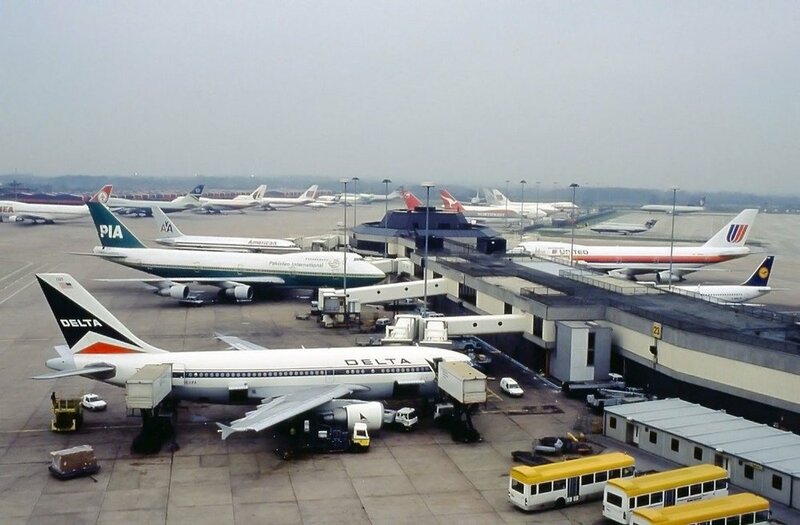 How things change…not a single one of the airlines pictured (7) are still flying today! Many thanks to Steve Ashworth for sharing. 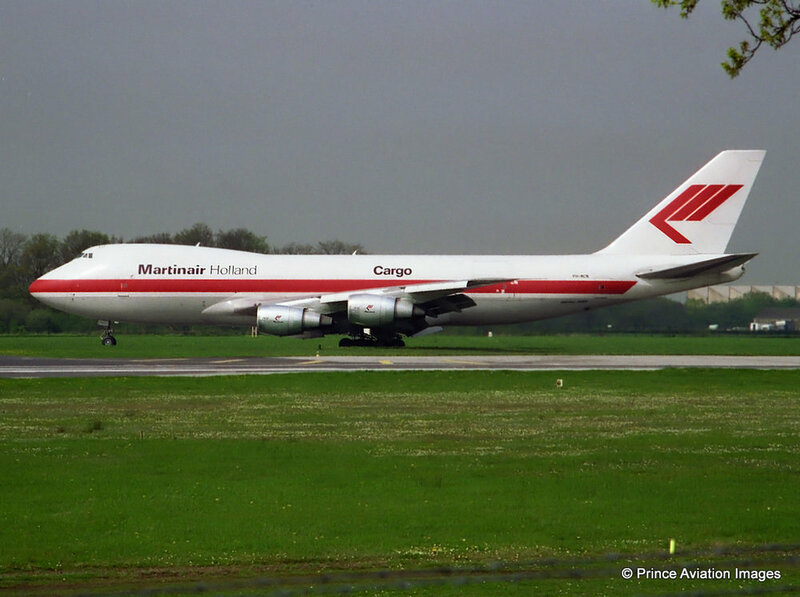 Martinair B747F PH-MCN operated a freight charter for Rolls Royce to Abu Dhabi on 26th April 1993.Photo - taken by Stuart Prince from the old South side Viewing Park. All photos published will be duly credited. Zambia Airways Dc8-43 9J-ABR is seen parked in the South bay on 21st March 1974. Photo Peter Hampson. 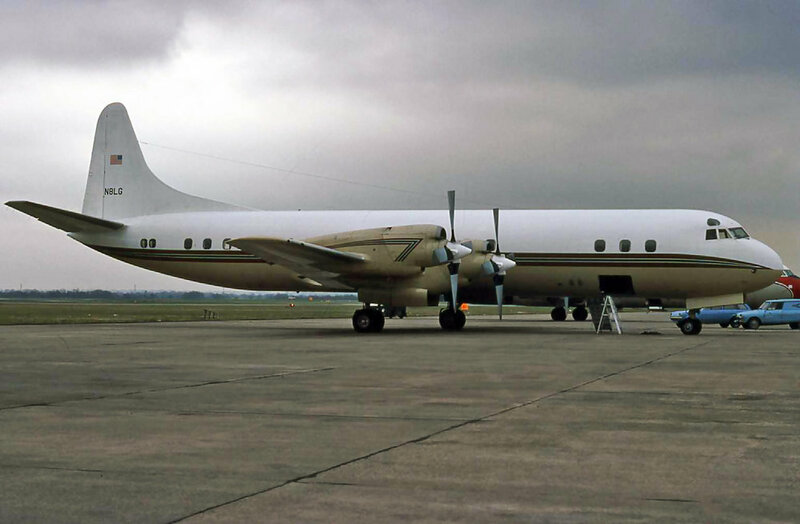 Lockheed Electra N8LG is pictured in the Southbay on 30th March 1979.The aircraft brought in John Denver on 29th for a concert in Manchester. The aircraft was in full VIP configuration and looked immaculate inside and out!Photo Peter H.
17th March 1996 was one of those “diversion days” which witnessed a good variety of aircraft and airlines paying us a visit from “Down south” - these included RAF Tristar ZD952 (ex British Airways G-BFCE) which arrived having diverted from Brize Norton as the Ascot 3451 from Ascension Island. We’re going back in time with this one - Its March 1961 prior to the “new” Terminal opening. Percival Prince G-AMKY is seen parked up on the old apron. Photo Bob Thorpe. Another great shot from Stuart Prince who nicely captured Cathay Pacifics B747-400 B-HOX from the T1 Multi Story back in March 2000 (Yes 19 years ago!). Good to see the Virgin Sun A320 creeping into the shot in the back ground. 4th March 1970 turned into being a classic in bound diversion day for Manchester due to heavy snow in the South of England. Probably the pick of 25 aircraft which diverted in was this Aerolineas Argentinas Boeing 707 LV-ISC - seen here on Pier B. A huge thanks to Eric Wright for sharing this wonderful memory. In these days the chemical Urea (don’t ask!) was spread on the aprons as an exceedingly effective de-icer…as you can see! Another from 4th March ‘70 saw Swissair Dc9 HB-IFT put in an appearance. 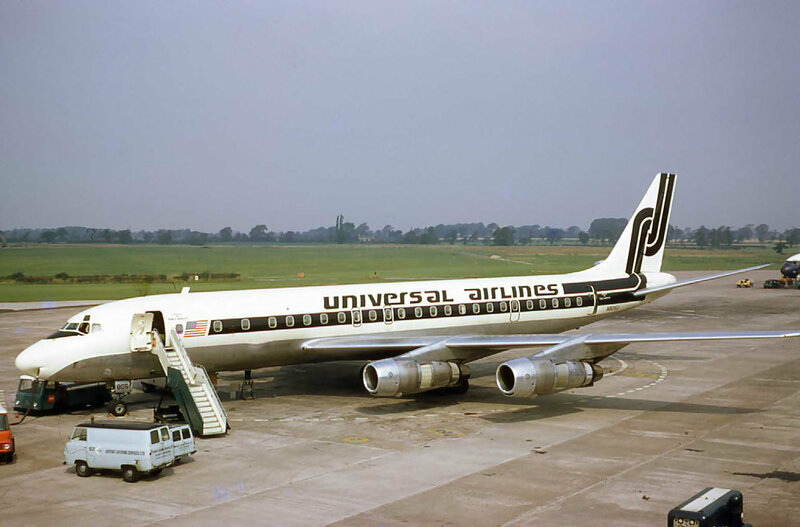 However, a real aircraft line up had started to materialise in the Southbay including a United Arab Airlines Comet (one of two that day),SAS Dc9,Austrian Airlines Caravelle and an MEA CV990 (unfortunately just out of the picture). Photo Eric Wright. I’m delighted that Eric Wright had a further delve into his photo files having read my comments above and came up with this shot. 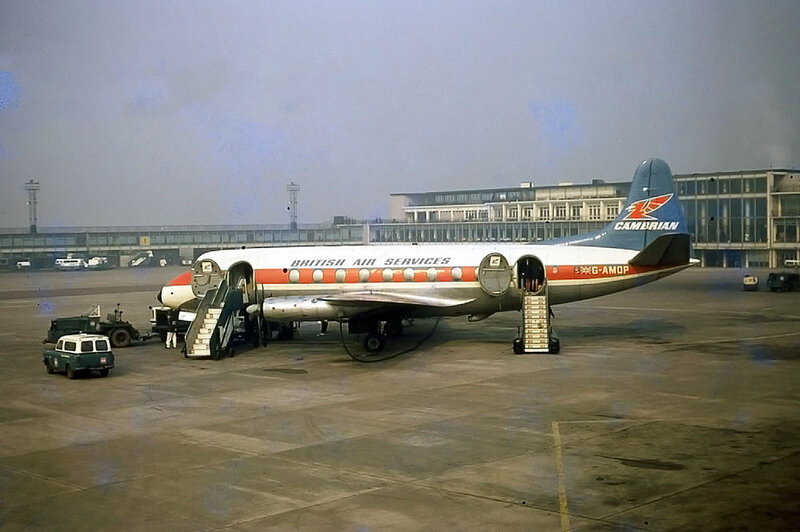 In his own words - not the clearest of photos.However, it truly captured the moment of an Austrian Airlines Caravelle, MEA Convair 990, Alitalia Dc9 and United Arab Airlines Comet diversions gathered together at Manchester on 4th March 1970. Over the years the Canadian Military have occasionally “popped up” at Manchester with various aircraft types. 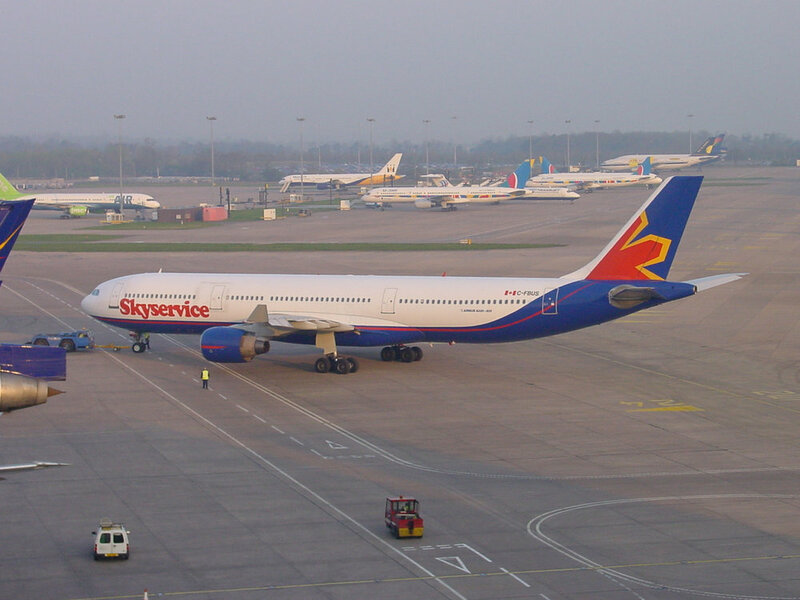 A310 serial 15003 is seen here being towed onto T2. 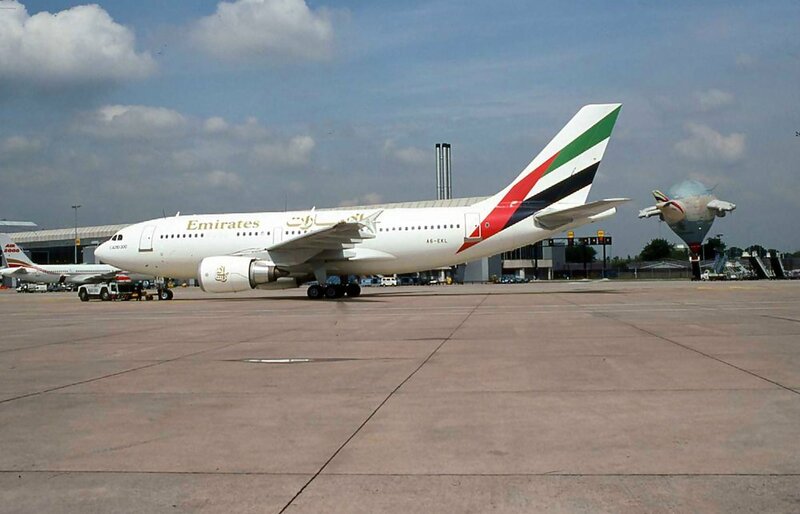 The aircraft arrived from Ottawa on 1st March 1997 and departed the following day to Dubai. Photo Stuart Prince. Dan Air Viscount G-ARIR is seen on finals to Runway 24 whilst some threatening clouds start to mass above.March 1977. Peter H.
A classic shot by Stuart Prince taken from the famous “Joe’s Field”. Seen landing on 9th March 1988 is Polar Air Cargo B747F N853FT. TMA Boeing 707 freighter OD-AFX is being watched closely by the local constabulary whilst being loaded on Faireys Apron.15th March 1973. Bob Thorpe. It’s another one of those quick snaps from the office window in the old Tower Block. Sterling B727-200 OY-SBF is the subject matter on this occasion.Peter H- March 1986. A great shot from Stuart Prince which really does capture a moment in time at MAN.Packing those diversions in, B747’s,American Airlines and even a BAC 1-11 creeping in on the photo! The main subject is of course the MD11 N1763 but whats taking place in the back ground is just as interesting…17th March 1999.Super shot from the T1 Multi Story…oh dear 20 years ago! A superb shot from Stuart Prince of the Laker Airways Dc10 - 30 N833LA departing off Runway 24 on 24th March 1996. The shot was taken from “the original Aviation Viewing Park” at the Southside on the former Brickworks site. One from March 1999 (3rd) . As Airfield Manager at the time it was my remit to maximise capacity with movements and aircraft parking to drive the aviation income up. Similar to now we were entering into an exciting phase of airport expansion - Runway,Terminal,Taxiways and Stands! BA were disposing of their Dc10’s - we did a deal with them and parked them all (5) on just 2.5 stands (innovative parking).Various other deals were done and what seemed like the Tri Stars of the world homed in on Manchester following another little negotiation with Air Atlanta (Iceland) and other similar companies. Whilst I was getting to grips with aircraft storage one of my good colleagues in the Airports Commercial dept thought we should try and focus on Hajj Pilgrim flights tapping into that market - we did.. and along came many new (and interesting) movements such as the Egyptair B747-300 SU-GAM above.Happy days! Yes, its another on of those airlines which operated the Hajj flights from MAN. 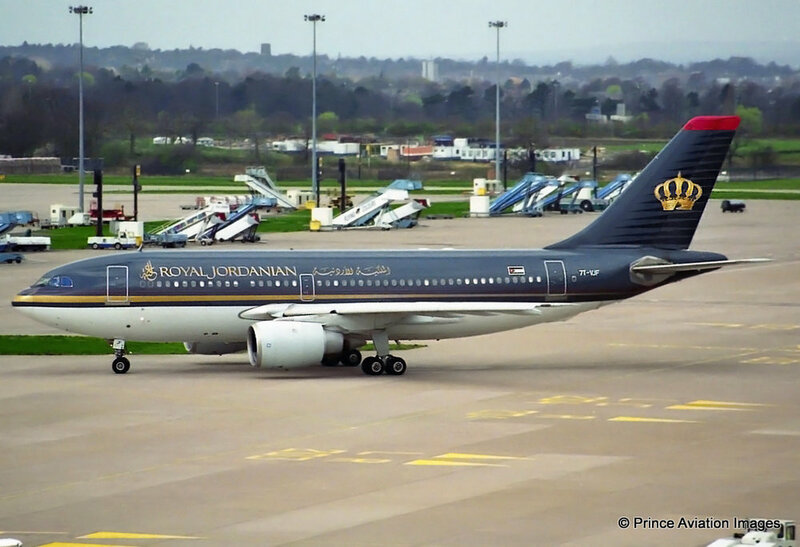 On this occasion it was Algerian A310 7T-VJF operating at the time for Royal Jordanian.Seen here departing T2 on 28th March 1997. Photo - Stuart Prince. Aaah yes! The infamous Air Ops TriStar P4-JAB (Originally built for TWA). One of those wonderful aeroplanes I could probably write a book about…The aircraft was with us for storage “for a couple of weeks” which ended up being a couple of years!! It spent a lot of time in what became known as “The Hampson Air Park” named after yours truly as a bit of a mickey take from the Airport CEO having gained something of a reputation for welcoming to MAN a number of aircraft for storage. (Making good use of the apron,its an airport after all! I said) However, this beauty became something of a bad debtor as its ownership changed and we thought it would eventually have to be scrapped on site. However, to our surprise all debts were paid and the time had come to say goodbye. 22nd March 1999 was the date and we even greeted its American crew personally on the ramp just to wave it on its way. They boarded the aircraft for its ferry flight. I think it was off to Roswell, one of the “Bone Yards” in New Mexico?. A couple of kicks of the tyres and a huge wet start later it was on its way. Myself,other members of the Airfield Ops Team,the Airport Fire Service all gathered in anticipation to watch the departure and hopefully breath a sigh of relief. The L1011 slowly moved down 24 gathering momentum and finally became airborne, probably due to the curvature of the earth?? Next,you guessed it… a full emergency was declared…and here she is returning to base,nicely captured by Stuart Prince, on two (not three) engines!! Many meetings followed with the boys from CAA Airworthiness and various aircraft engineers.Fortunately, she eventually did make it to Roswell.. but what a lot of paperwork! Kar-air operated their beautiful Dc6 Swing tail freighter OH-KDA on regular services into Manchester on behalf of Finnair. She is pictured here on the old freight apron in February 1978.Peter H.
Balair Dc4 HB-ILD looks grand at the end of Pier A in a Winter Scene shot on 14th February 1969 by Bob Thorpe. A Viscount and tail of an Argosy can be seen to the right of the Dc4 nose. Capturing the moment….A fine shot by Bob Thorpe of a LOT AN12 SP-LZB on 14th February 1969. 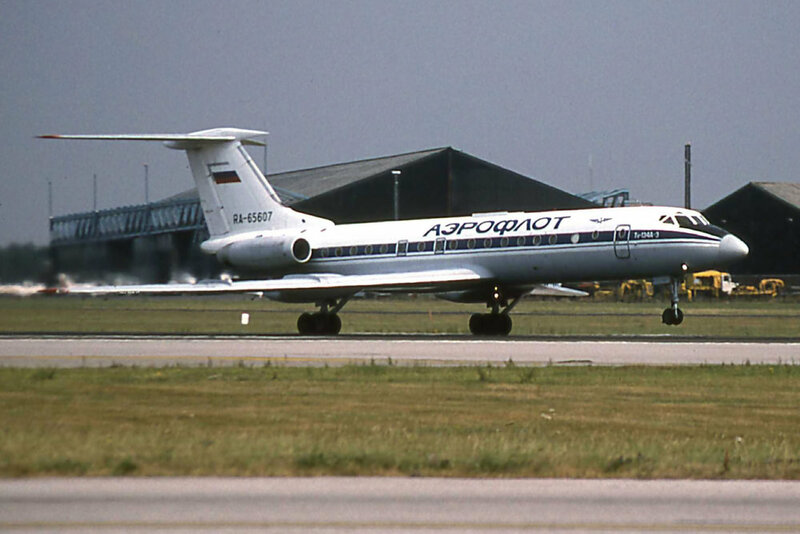 2nd February 1978 saw a very rare visit from an Air Alsace VFW-Fokker 614 registration F-GATG. 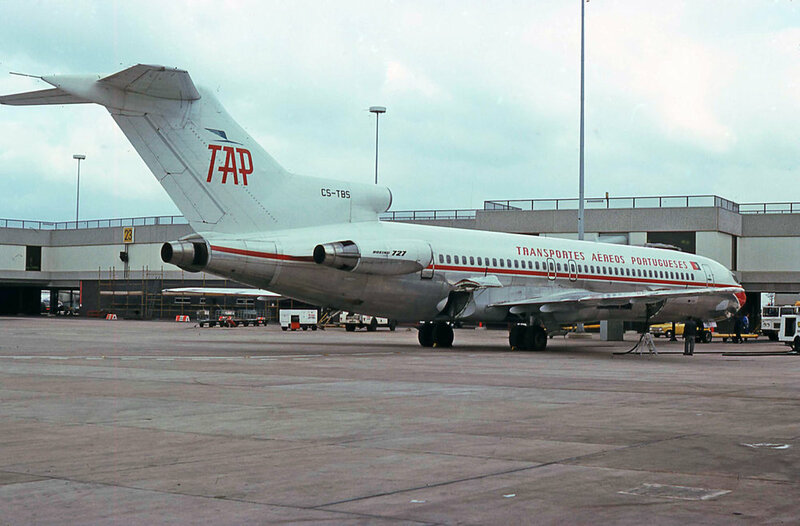 Photo Peter H.
Autair BAC 1-11-400 G-AVGP is captured from the old spectators terrace (Pier B) by Bob Thorpe in February 1969. As we look out to the West the former approach lighting for Runway 02/20 can be seen. What could be described as a very typical East Side of Pier B photo from February 1975. British Airways BAC-111’’s galore! Peter Hampson. United Airlines B747-200 N159UA (ex QANTAS VH-EBK) diverted into Manchester from Heathrow on 28th February 1996 due to low viz at Heathrow. Many thanks to Stuart Prince for sharing with us. A bit of self indulgence on this one….Parked in front of the Gulfstream 2 N401M is my very first car. A Hilman Minx registration JNC474F, known as The “Jeanie Minx”. Those were the days when if you had an airport pass you could drive your car through the Security check point round the peri track and take a nice photo or two on Fairey’s Apron. Many of my good old friends will remember the car as it was well and truly hammered on “Spotting trips” throughout the length and breadth of the country (as you did in those days)…Aaaah Husbands Bosworth, Castle Don, Leicester East, Panshangar, Luton …here we come!! Despite the pose I never did get to fly in a Gulfstream…Dream on… Peter H. February 1977. 26th February 1969 saw this beautiful IL18 OK-PAG of Czechoslovakian Airlines calling in on a football charter.Hubert Parrish. Dan Air (Hangar 4) had a contract to contract to carry out 3rd Party maintenance on the Cyprus Airways BAC 1-11 Feet.The aircraft registrations became the curse of spotters as they were hidden almost beneath the engines on the lower fuselage. BAC 1-11 537 5B-DAH is seen here (complete with hush kits!!) parked in the South bay in February 1979. Oh dear looks like a sweeper is required for the FOD on the apron..tut tut! Peter H.
Over the years there have been many rare aircraft emerge from a hangar at Manchester having received a paint job.However, this one ranks right up there as one of the most unusual.16th February 1979 was the date when this Shorts Skyvan emerged from Dan Airs Hangar 4.The aircraft had arrived in primer on 2nd Feb and here she is two weeks later getting ready to depart on delivery to the Botswana Defence Force!! Peter H.
TC-FLG an A300 Airbus B4 leased to Sudan Airways from Fly Air Turkey and still wearing the colours of its former owner - Japan Air System. The ageing lady is captured here on approach to MAN on 24th February 2004 by Steve Ashworth. The aircraft was withdrawn from use just a few months later after 24 years service.